Anthony Weiner Welcome to Prison ... Enjoy the Cheese Pizza!!! 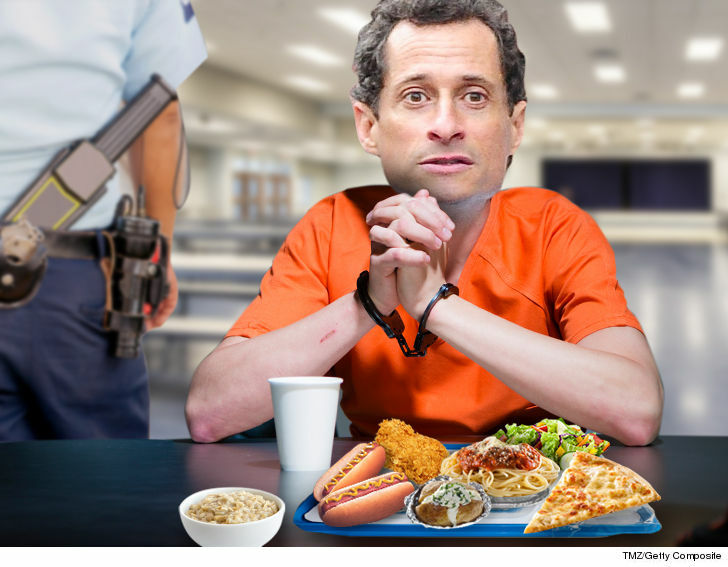 When Anthony Weiner reports to prison, he can take solace in the fact that the lunch menu for his first day includes everyone's favorite food ... pizza!!! The disgraced congressman is set to begin his 21-month prison stint Monday for sexting a minor. He'll do the time at the Federal Medical Center in Devens, Massachusetts. The weekly menu for the facility, obtained by TMZ, shows that, at the very least, he'll get well-balanced meals. Monday's breakfast choices include oatmeal, coffee cake or wheat toast with jelly. For lunch he can chow down on cheese pizza, spaghetti and a garden salad. The dinner includes chicken fried rice, black beans and carrots. Not bad. Weiner can look forward to more tasty meals later in the week -- like a chicken patty sandwich for Tuesday's lunch, burger and fries (or baked potato) for Wednesday ... and a Weinerrific dinner on Friday -- 2 hot dogs!!! Last but not least, Weiner and his fellow inmates will be served breakfast for dinner -- eggs, home fried potatoes and creamed beef biscuits -- on Saturday night for Veteran's Day.